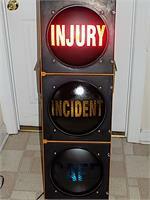 This Custom Lens Signal is popular with safety directors and those who are in charge of safety awareness at manufacturing and production facilities. Just what you were looking for! A real authentic traffic light that you can plug in and then watch it rotate through the colors! This is a lightweight polycarbonate 12" custom lens signal with a new paint finish & sequencer. Video of it operating is available and can be emailed to interested buyers. 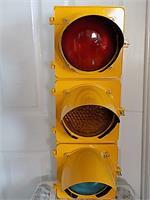 This is a new Polycarbonate (plastic) Traffic Light with 12" Custom Lenses & 4 Position Switch Dimensions are approx. 42" tall, 15" wide, 7" thick. This light comes equipped with a Red, Yellow, Green, and Green Arrow lens. Or any combination of those lenses.